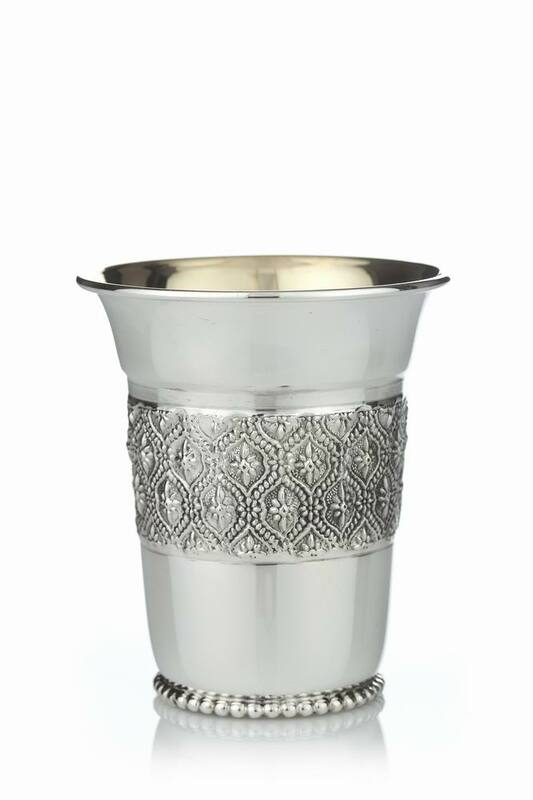 Two interwoven rows of engraved Starburst accents framed in filigree lattice work design encircle this Sterling silver Kiddush cup created by Hadad Silversmiths. Larger silver beads trim the bottom of the cup will the rim is curved outward for easy pouring.Made in Israel by Jewish Laborers. Sterling Silver Wt 68g. The cup holds Shiur [halachic amount] wine required for Kiddush. Because only Jewish artists created this cup, there is no need to Tovel [immersion in a Mikvah] it.